Do you regularly host events as part of your work and/or play? Do you run a venue or plan events regularly? Are you an Eventbrite user? If so, we have some exciting news for you — we’ve teamed up with Eventbrite to bring you two new WordPress.com themes that make it super easy for you to promote your events, stir up pre-gig fervor, and connect with your audience. Our Eventbrite themes seamlessly sync your Eventbrite events to your WordPress.com site with just a few clicks, and are perfect for gatherings of any kind. 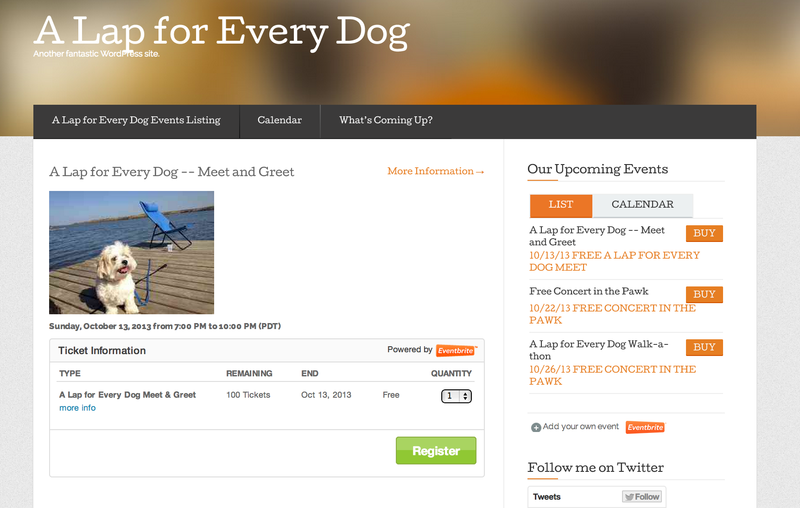 Create an event on Eventbrite, connect your account via your WordPress.com theme options, and select the events you wish to showcase. These themes are great for creating excitement before your shindig — priming your audience to have a fantastic time — and staying connected after the event via social sharing, photo tools, and post-gig comments. One-off Event Organizer? Event Planner? Venue Owner? Step right up! Share event details with potential attendees. Guests can register to attend or buy tickets to your event right from your site. 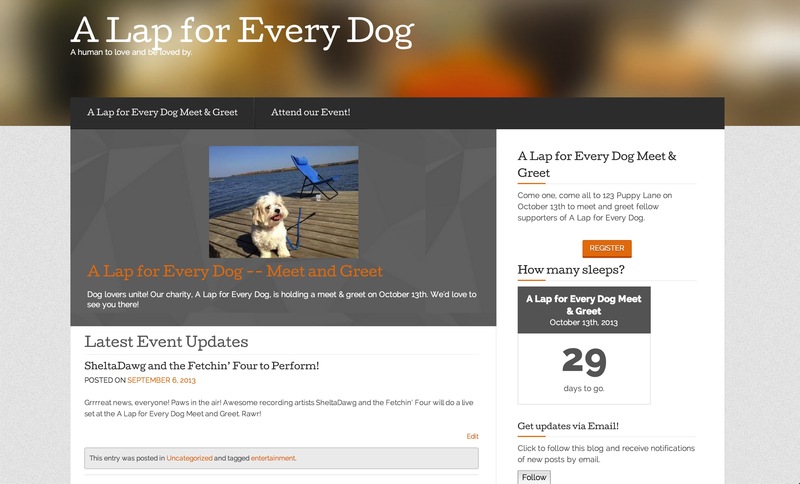 Our Eventbrite themes are not the only place to showcase your events. If you’ve got an Eventbrite event to promote, we’ve also got a new widget to make adding your event on any WordPress.com website a snap. The Eventbrite Calendar widget puts your event right on your sidebar to help entice participants to attend and give them the chance to register or purchase tickets with one click. We are super excited about these new themes and widget and can’t wait for you to start playing with them! Can’t see any link to download the Eventbrite calendar widget. Go to Appearance >> Widgets in your WordPress.com dashboard. You can drag the Eventbrite widget to your sidebar from there. SWEEEEEEEEEEEEEEEEEEEEEEEEEEEEEEEEEEEEEEEEEET!!! I have literally been waiting for this for YEARS!!! Wow…I’ll have to keep this theme in mind when I open my live entertainment venue/coffeehouse. Just to be clear – I use WordPress, but have my own domain (www.GeminiRedCreations.com) – can I use this plug-in on a site like that? I would want to use it to let people know about vendor shows I will be attending / setting up a booth for my online shop. The Eventbrite themes and widgets are for WordPress.com sites — the site you’ve mentioned above is a self-hosted WordPress.org site. There are plans in the coming months to make these themes available to WordPress.org users and share the widgets as plugins. WOW! I was waiting for this tools long time ago! Every time I help my clients with an event, I have to copy and paste codes into wp to display the eventbrite functions. It would be a great tool for next event. Thank you! Very excited to see your news post below – a lovely blog theme but only for wordpress.com and not for .org open source… is there anything coming up soon for developers? I have a client who has asked me to find a free or premium theme –specifically an event management theme, to download and build which allows to book multiple conferences per year across multiple locations in New Zealand. I know we need eventbrite for the registration of attendees and issuing tickets, but it still needs to get integrated into a good WordPress theme, to help with displaying speakers and schedules and all the other things that event brite doesn’t do. i.e. we need to cross reference attendees tickets, because after the conferences, we will give each attendee log in membership access to the website, to download supporting documentation, available only to those having attended conference. I am having a bit of trouble finding the best wordpress theme to download for this purpose, do you have any advice for me, I have searched google, and I have noticed there is a premium theme “EventManagerBlog and Januas” which provides good support for integrating Event Brite, but my client wonders if there is a free theme still out there that could do the job; I doubt it – and I would need help from a helpdesk anyway, doing the eventbrite integration, as I am a web designer not a developer…. I also looked at eventespresso.com and it had a huge raft of hidden extra costs….bit of a trap really. 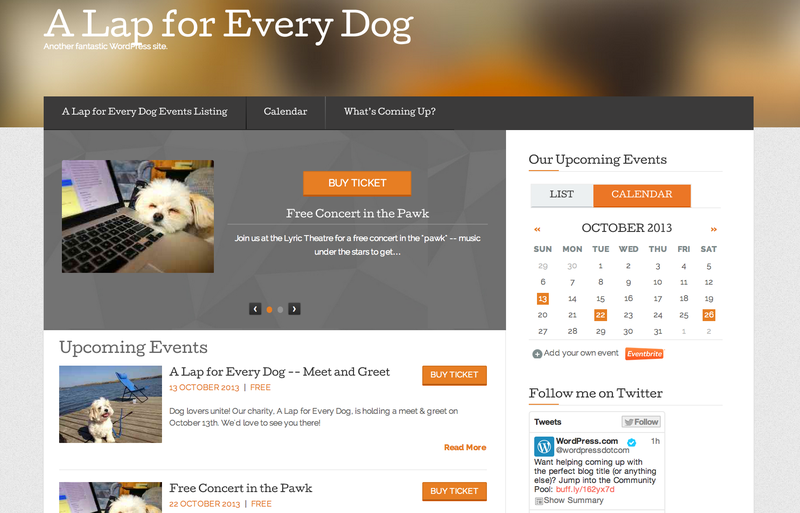 There are plans in the coming months to offer the Eventbrite themes to WordPress.org users. We don’t have a set release date just yet, but the project is definitely on the burner. 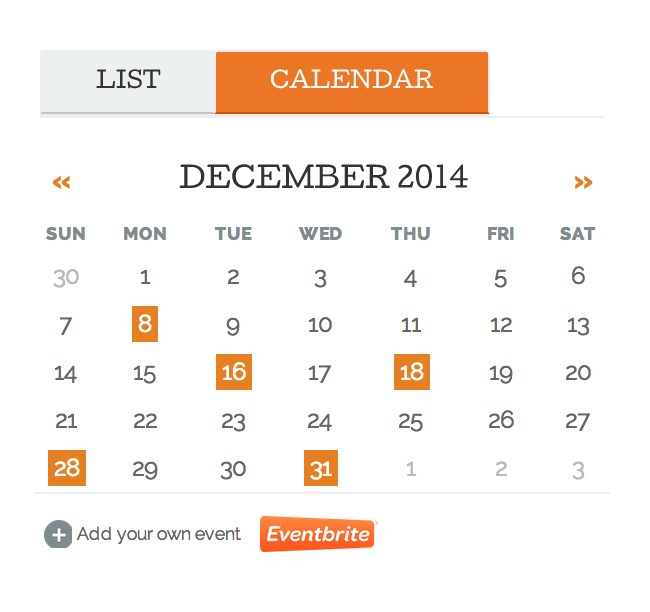 In your dashboard, go to Appearance > Widgets to drag the Eventbrite widgets into your sidebar. I love the concepts of this theme, so beautifully done too. I can think of many reasons to use this theme. Do I need to sign up with Eventbrite first before using the theme? I don’t have events that require users to register or buy tickets. I just want to showcase the events (you know, the community stuff) and be able to use the calendar widget on my side bar. Thanks. The widget takes advantage of a connection to your Eventbrite account — it pulls in event details automatically. You would need an account with Eventbrite to take full advantage of the widget — there isn’t a mechanism to add in events manually. Oops . . . The link to Eventbrite in the first paragraph of the quote doesn’t seem to be working. The Eventbrite themes and widget look like they will be very useful! I am really excited by these options. But when I try to validate my Eventbrite account I get the following error message “Malformed request. Please go back to the previous page and try again.” I have tried this a number of times both using the widget and using the theme and I get the same message. Do you have any suggestions as to why this might be happening? This is very nice. The look of it really captured my attention. Even three days after the post was published, Eventbrite link (paragraph 1, line 3) redirects to a “not found” page. Editing should be done there. BTW, I tried eventbrite.com and found it extremely useful. Thanks for adding such a great utility to WP.com. Thanks for the note about the incorrect link — fixed! Can you explain what you by Event Espresso has a bunch of hidden fees and is a trap? The only price you pay is right on the pricing or add-on page(s): http://eventespresso.com/pricing or http://eventespresso.com/add-ons/ ? Event Espresso has package and al la carte pricing so I’m trying to understand what you mean by your comment. Does’t seem very accurate. 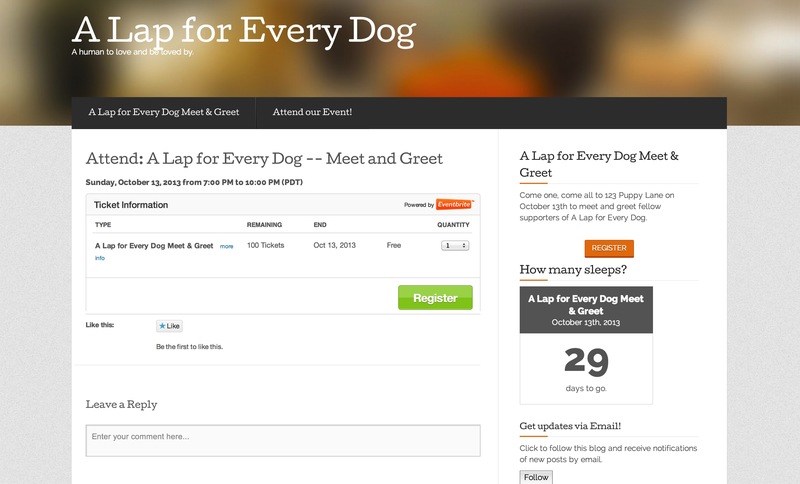 Right now you do need to use one of the special Eventbrite themes to take advantage of their features.